I recently interviewed an e-commerce entrepreneur on a forum about pop-up promotions. I was going over the various ways of strategically using website pop-ups to drive more conversions by targeting specific visitors, actions, and pages on site. His response: There’s nothing strategic about using pop-ups. The response from this retailer, who shall remain nameless, displays a problem that I see with a lot of struggling e-commerce businesses: a lack of definitive strategy and purpose. Of course, you want to sell more, but how do you plan to accomplish this? E-commerce marketing is about presenting relevant products and information to the right people. With the availability of targeting and segmentation, businesses now have the ability to create a more personalized and relevant shopping experience. An e-commerce retailer is going to have new visitors, repeat visitors, returning customers, pesky cart abandoners, visitors from around the world, and so on. The reality is that you need to engage types of visitors differently and pop-up promotions allow you to do this in a number of ways. 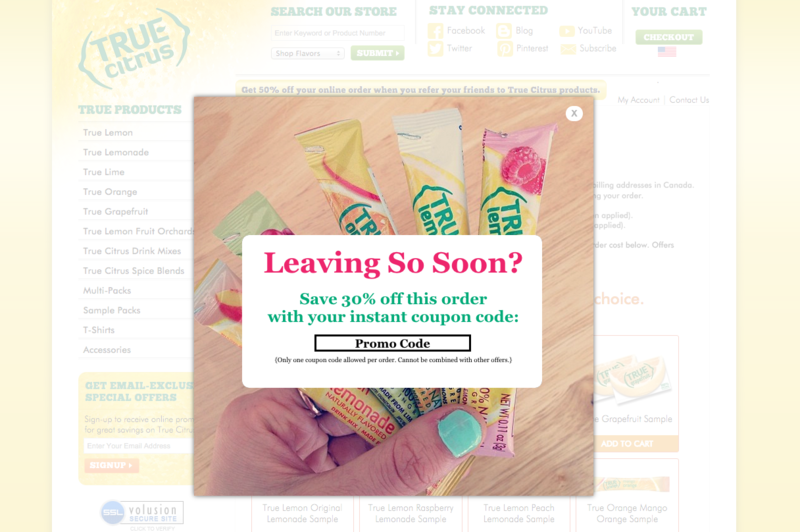 Now, here’s a list of six strategic ways to use pop-up promotions for personalization and conversion optimization. 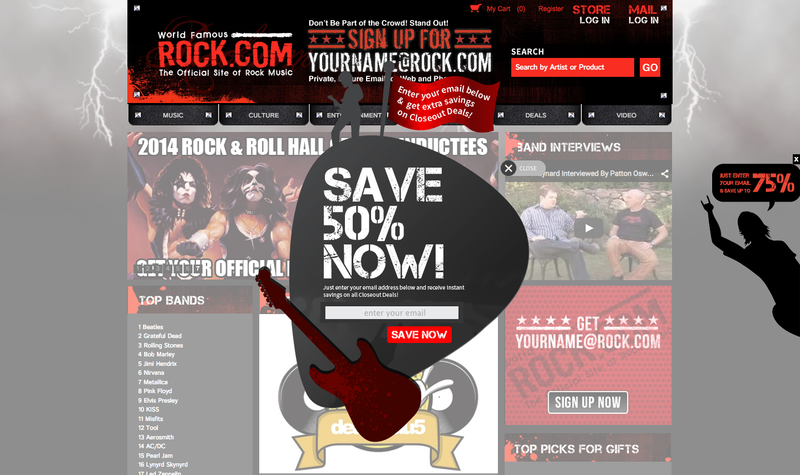 which promotions to use to get visitors to convert. Businesses spend a lot of money on driving traffic to their website yet very few dollars are spent on converting that traffic. In fact, for every $92 spent on driving traffic, only $1 is spent on optimizing the shopping experience for conversions (Source). Whether you’re paying for traffic or organically growing traffic through SEO, you need an effective way to convert these new visitors. Because 98% of visitors do not convert in their first visit, you need an effective way of acquiring email addresses. To do this, I’d recommend engaging visitors with an enticing promotion in which they can receive value by submitting their email address. Present an offer that is of high perceived value to your target shoppers and also a low barrier of entry. You want to make it easy for shoppers to make a decision and then enter their email. Hit visitors with your promotion within the first 15 seconds of their visit. Why? 55% of traffic leaves your site within 15 seconds of arriving on your site. You have minimal time to engage website visitors so do it very soon after their arrival. This ensures that almost all traffic will see your offer which will result in more email submissions. Promotional rule setup documented here. Also, consider offering a piece of content to visitors. Content has become a big part of e-commerce marketing strategy and if you can provide value through this avenue, your site will stand out from competitors. 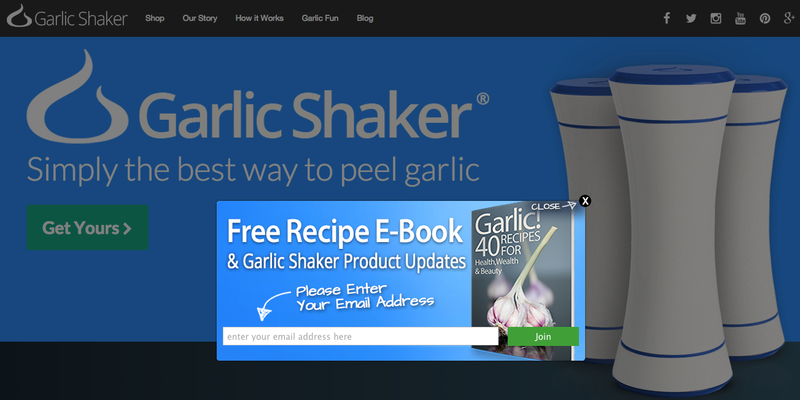 Garlic Shaker has seen incredible list building success by offering a garlic cook book to visitors. This allowed them to build a community around their product, even before they were selling Garlic Shakers. The gated content promotion grew Garlic Shaker’s list from 220 subscribers to over 20,000 subscribers! Returning visitors are coming back to your site for a reason which means that they can be of high value. Generally, return visitors will have lower bounce rates, view more pages and spend significantly more time on-site which presents a great opportunity to close sales. They have returned to your site to further research your products, compare prices, or to purchase from you and you can use your promotions to get these shoppers to convert. Returning visitors are much more inclined to purchase so you should target them with sales driving offers. 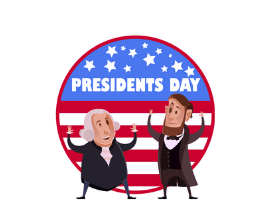 Engage them with a discount or free shipping offers to provide an incentive to purchase today. Discounts have always been an effective way to influence purchasing decisions. To put it in obvious terms, the higher the discount, the more sales influence the promotion will have. For your business, figure out what works with your margins. You can always run higher discounts during big sales and times of increased traffic. Free shipping is a game changer. Since the birth of e-commerce, shipping has been a way for businesses to set themselves apart from competitors. Now, free shipping has almost become an expected option. A study by Harris Interactive and UPS found that on average, retailers experienced a 10% increase in revenue during the period of running a free shipping promotion. Free shipping can also help with customer retention because shoppers are going to buy from places that meet their needs and for most shoppers, free shipping is one of those needs. The most frustrating problem for online retailers is how to reduce cart abandonment. On average, 80% of shopping carts are abandoned. Instead of looking at that percentage and getting down about it, let’s look at it as an opportunity. If you can find a way to decrease cart abandonment slightly, this can result in thousands of dollars in additional monthly revenue. 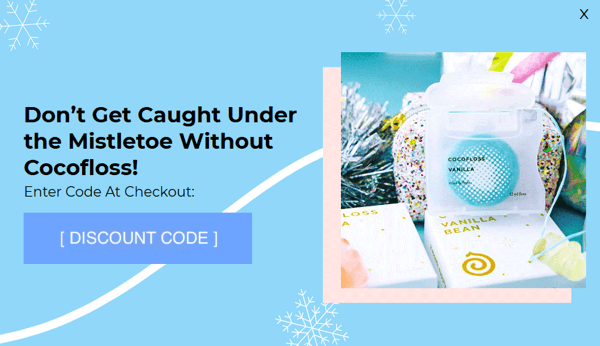 To specifically reach cart abandoners with offers, implement an exit pop up that is only displayed to shoppers who attempt to leave your cart page. By presenting a discount or free shipping promotion at this critical point in the purchasing process you can prevent cart abandonment from happening. To make this offer more enticing, consider offering a bigger discount or a discount and free shipping. Also, don’t require shoppers to enter an email or complete an action to receive the promo code, just give the code to them. This eliminates yet another barrier that the shopper would have to go through to complete the purchase. Here’s how to set up an exit offer on the cart page. E-commerce is global and chances are you’ll receive traffic from different locations throughout the world. 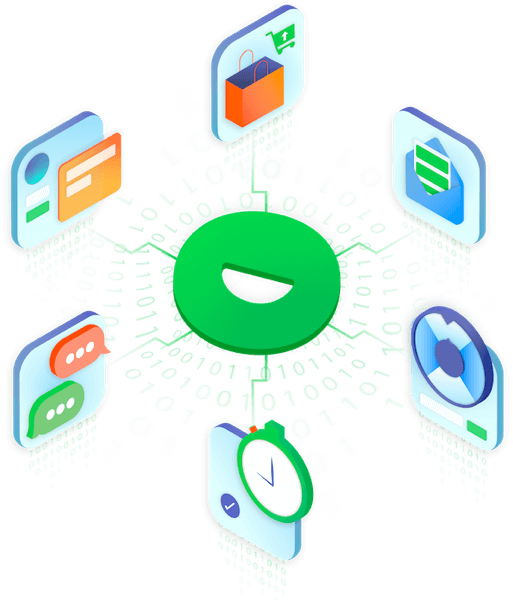 While many businesses are treating this global traffic in the same way, you can stand out by presenting personalized messages and offers to different parts of the world. This allows you to accommodate and meet the needs of global visitors. A great example is shipping promotions. Your business will most likely be able to offer free shipping to a few countries, but certain distances will eat up your margins and free shipping simply isn’t feasible. With a geotargeted promotion, you can notify shoppers who qualify for the promotion that they can receive free shipping. Or maybe you can offer free shipping to overseas countries. This is a unique selling point to set yourself apart from competitors. 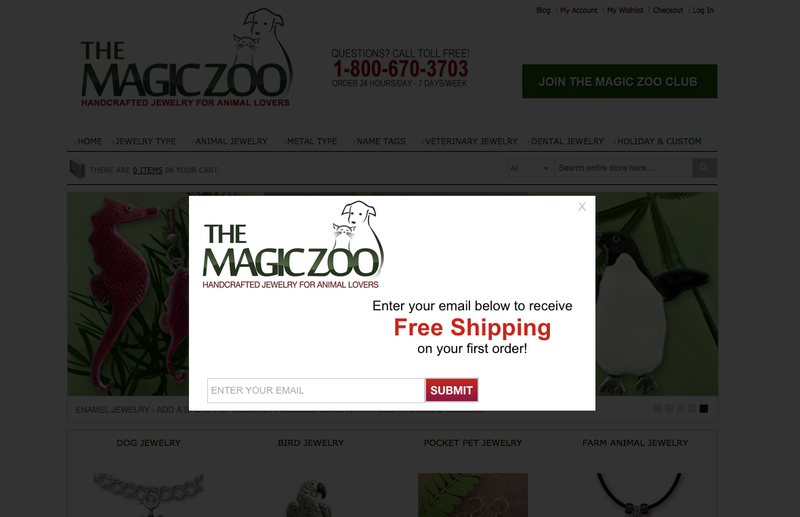 Use a pop-up to display your promotion to global visitors and get them to purchase from you. You can target visitors by Country, State/Region, and even zip code because sometimes you need to be ultra-precise! Different pages on your site serve different purposes and you may want to engage shoppers in different ways on these pages. Consider running specific promotions on product pages, landing pages, and sale/clearance pages to drive conversions. For example, if you are receiving a lot of new traffic to a landing page, use a high converting offer like a contest, where visitors can enter to win a high-value item by submitting an email address. This way, you can convert the visitors who are interested in what you offer but may not be ready to purchase. Another great example is using a promotion to move clearance inventory. Slow moving inventory takes up valuable shelf space (both on your site and in your warehouse) and also ties up capital. If certain items aren’t selling, it’s best to try to sell them by any means. This can mean discounting the items up to 75%. Using a website pop-up to either notify shoppers of your clearance section or offering higher discounts of specific product pages can help you close more sales and clear out the pesky, old inventory. Setup Instructions for this promotion can be found here. If you’re paying for traffic then you want to maximize your return on that investment. This means tweaking your ads and copy to better relay your message to people. But it also means having a strategy in place to convert these visitors once they get to your site. This is where traffic source segmentation comes into play. Engage paid traffic with a high converting promotion within 10 seconds of their visit. Why within 10 seconds? Based on multiple tests, presenting a promotion 7-10 seconds into a visit results in significantly higher visitor engagement. What are examples of high converting promotions? As I mentioned earlier, a contest promotion converts visitors at much higher rates because of its perceived value and its low barrier to entry, just an email. Here’s a fantastic example from Isle Surfboards. 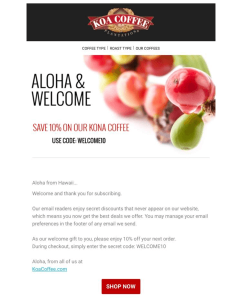 Their offer is attractive to their target customer and is an absolute no-brainer for visitors to enter their email. Your visitors are different people at different stages in the buying process and you need to tailor your shopping experience to provide relevant offers and messaging throughout your site. With targeted promotions, you can create that experience in order to drive more engagement, generate more leads, and increase sales conversions. Implement targeted promotions today with a free 14-day trial of Justuno.